Thanks to a new addition by Scott, Village Gamer now has a brand new national events calendar – categorized by provinces and territories. This new events calendar is much more functional than the previous event page we used to have – but wait, that’s not all. The new calendar offers three different views – Month, Week or Agenda. Agenda is the default view, which allows visitors to view the entire year’s worth of events in one screen, similar to the old Upcoming Events page. While in Agenda view, visitors can opt to have all events expand with more information (as explained below), and events for “Today Only” can also be selected in any view option. To see events for any given province or the territories – or a selection of areas, visitors can click on the Categories drop-down menu to the upper right of the calendar. Simply click on any of the desired regions to view those events – the calendar view will update as regions are selected or unselected. 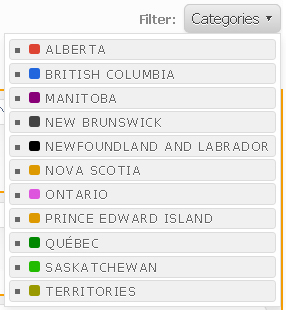 To disable the filter, click on the X that will appear beside Filter when regions are selected. On the old calendar, when visitors clicked the linked event names, they were taken to the event’s page to get further information, but now with our shiny new calendar, when visitors click the link they get a drop down information window that offers an event description, and if the Read More button is clicked, visitors can get ticket cost, organizer name (when available), venue location with Google maps, dates and times. The events calendar can also be synced with Outlook by clicking the Subscribe button (or Add To Calendar button, depending on if you’re viewing the front page or event info page), or with Google Calendar by clicking the Google Calendar button. An even better feature is the ability to sync the events for chosen calendars, such as just BC events, or BC and Alberta events, for example. As a bonus, whenever the calendar is updated, the new updates are automatically added through the sync download feature. As always, our readers are welcome to have their interactive digital media events, film festivals, business education, tech-related events or other happenings across Canada that would be of interest to those who work in the technology industry sectors added to the calendar, just drop us a note with a link to the event and if it fits within our mandate, we’ll add it to the calendar. This entry was posted on Wednesday, January 4th, 2012 at 5:58 am and is filed under National News, Site News. You can follow any responses to this entry through the RSS 2.0 feed. You can leave a response, or trackback from your own site.